Healing of Chronic Calcaneal insertion and corporeal Tendinotinis could be accelerated by Dynamic Manual Adhesiolysis®. Exclusion of Achilles bursitis – that are easily treated when their causes are eliminated (friction, support of hyper-counter of the shoe) – and Haglund disease for athletes (interim efficiency). 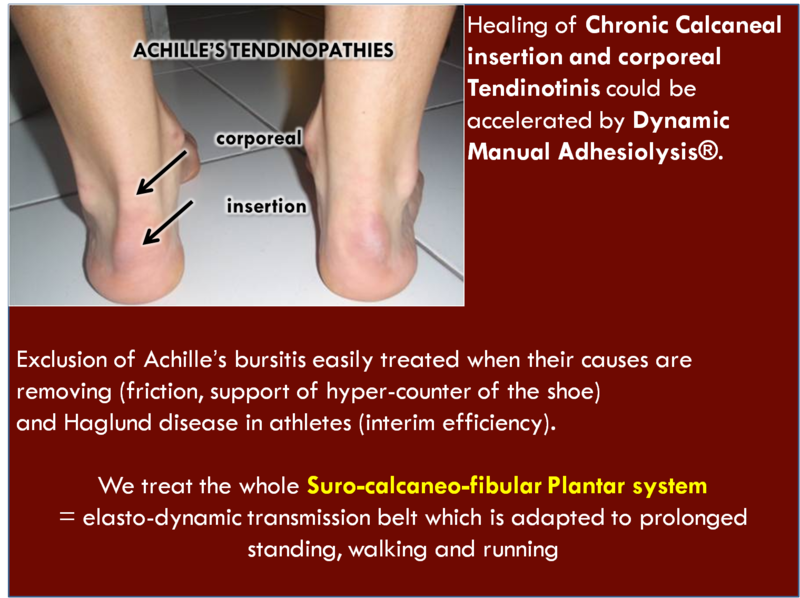 We treat the whole Suro-calcaneo-fibular Plantar system (elasto-dynamic transmission belt which is adapted to prolonged standing, walking and running). 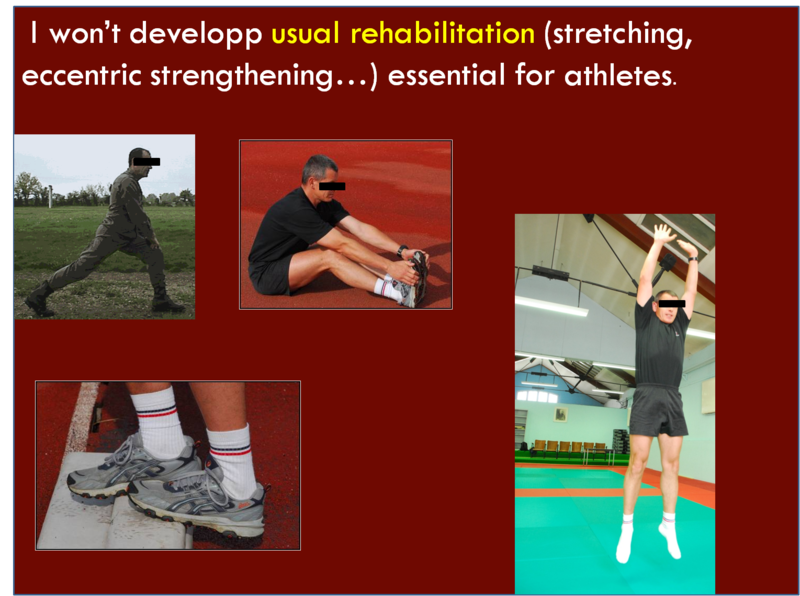 I won’t develop usual rehabilitation (stretching, eccentric strengthening…) essential for athletes. Whathever the order, Dynamic Manual Adhesiolysis® is a seven steps treatment. After that, we need to do the usual osteopathic treatment of the dysfunctions of the foot, ankle, knee (fibula head is almost always subluxed) and the rebalancing of the pelvis (result or cause of the calcaneal tendinotinis). The Manual Adhesiolysis can be started with antagonist anterolateral compartment of the leg, always contracted-stuck for compensation. 1. Anteromedial tibial compartment “opening” on its full height. It consists in breaking adhesions between periosteal insertions of muscles (posterior tibialis, Flexor Digitorum and Hallucis Longus with Soleus) and the posteromedial tibial border. It should liberate the posterior tibial neuro-vascularization and recenter laterally the calf muscles. 2. Adhesiolysis of Calf restores gliding of Sural Triceps muscles (medial, lateral Gastrocnemius and Soleus) from popliteal fossa (Gastrocnemius condylar insertions…) to common tendon blade. It releases the popliteofibular, tibiofibular circulation and laterally recenter the calf. 3. 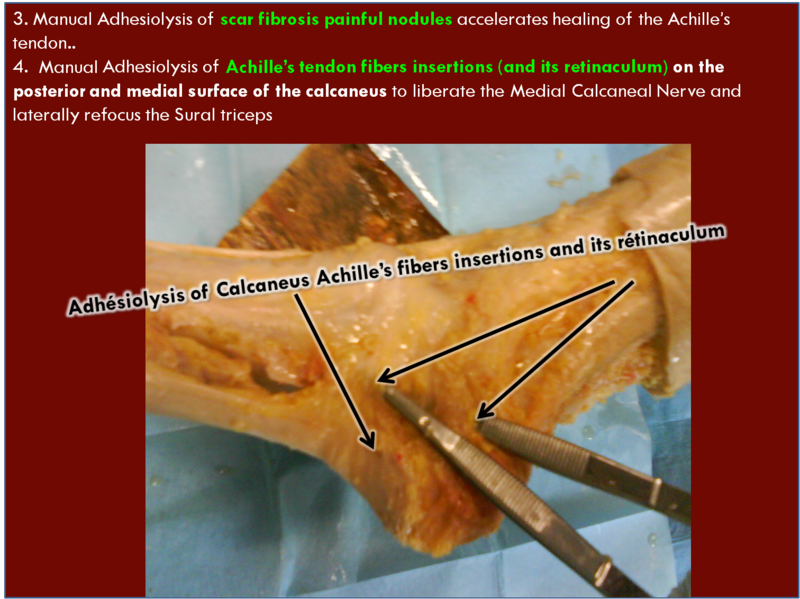 Manual Adhesiolysis of scar fibrosis painful nodules accelerates the healing of the Achille’s tendon. 4. Manual Adhesiolysis of Achilles tendon fibers insertions on the posterior and medial surface of the calcaneus liberates the Medial Calcaneal Nerve and laterally recenter the Sural triceps. 5. Think also to perform Adhesiolysis of the Posterior Tibial Nerve; Tibialis Posterior, Flexor Digitorum and Hallucis Longus tendons under and behind the medial malleolus. 6. 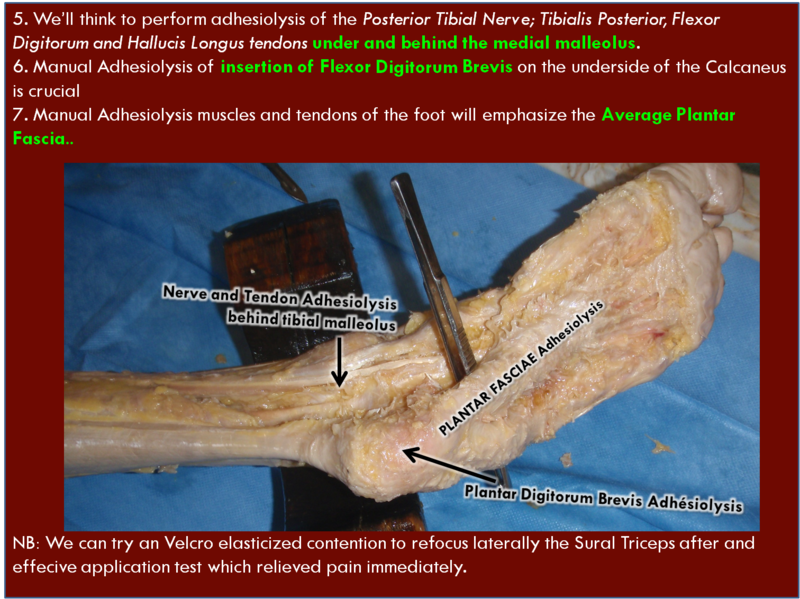 Manual Adhesiolysis of the insertion of Flexor Digitorum Brevis on the underside of the Calcaneus is crucial. 7. 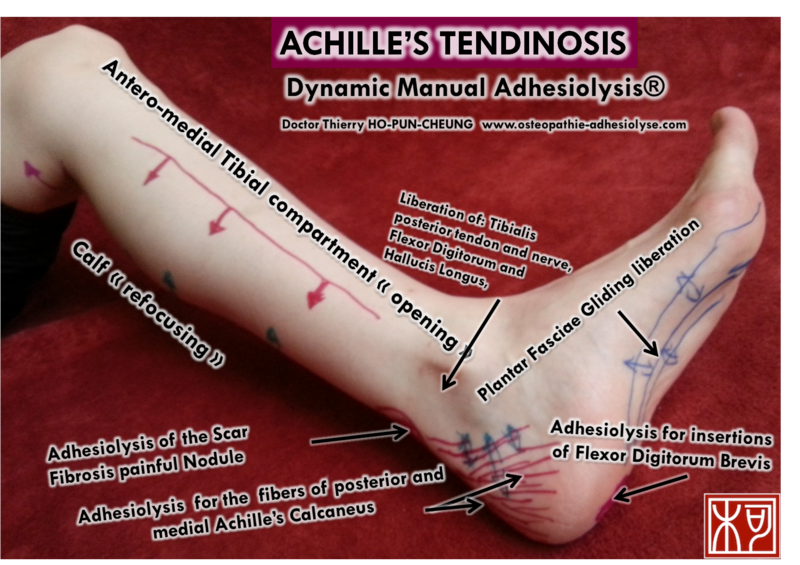 Manual Adhesiolysis for the muscles and tendons of the foot will concentrate on the Average Plantar Fascia. NB: We can try an Velcro elasticized contention to recenter laterally the Sural Triceps if an application test relieved immediately the pain.